354 Commonwealth is located on the south side of Commonwealth, between Hereford and Massachusetts Avenue, with 352 Commonwealth to the east and 356 Commonwealth to the west. 354 Commonwealth was designed by Obed F. Smith, architect, and built in 1883-1884 by Vinal & Dodge, masons, for building contractor George Wheatland, Jr. for speculative sale. He is shown as the owner on the original building permit application, dated November 30, 1883. The house was originally numbered 352 Commonwealth until about 1889, when 328 Commonwealth was built and the houses to the west of it were renumbered. 354 Commonwealth was one of thirteen houses (336-360 Commonwealth) built for George Wheatland, Jr., by Warren D. Vinal and Charles A. Dodge on land owned by Charles Merriam and by Jacob Rogers. 336 Commonwealth was designed by George Avery, 338-340 Commonwealth were designed by Bradlee, Winslow, and Wetherell, and 342-360 Commonwealth were designed by Obed F. Smith. 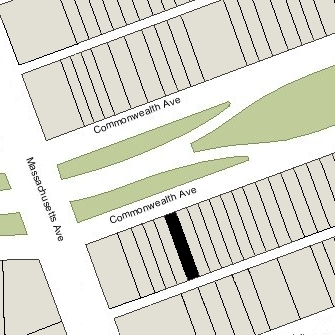 Click here for an index to the deeds for 354 Commonwealth, and click here for further information on the land on the south side of Commonwealth between Hereford and Massachusetts Avenue. On September 11, 1884, Jacob Rogers sold George Wheatland, Jr., the land where 352-354 Commonwealth were built. On September 18, 1885, 354 Commonwealth was purchased from George Wheatland, Jr., by Anna Maria (White) Wood, the wife of banker and broker George Francis Wood. They previously had lived in Newton. George Wood died in July of 1903 and Anna Wood moved soon thereafter. During the 1903-1904 winter season, 354 Commonwealth was the home of John William Corcoran and his wife, Margaret Josephine (McDonald) Corcoran. He was an attorney and former associate justice of the superior court, and had been a candidate for Massachusetts Attorney General and Lt. Governor. The Corcorans’ primary residence was in Clinton, where they were living at the time of his death in August of 1904. During the 1904-1905 winter season, 354 Commonwealth was the home of investment broker Frederick R. Tibbitts and his wife, Mabel Tibbitts. They previously had lived at the Hotel Somerset. They also maintained a home in West Manchester. They had moved from 354 Commonwealth by the next season, and by the 1906-1907 season were living at 96 Bay State Road. On May 1, 1905, 354 Commonwealth was purchased from Anna Wood by Helena A. (Cox) Raymond, the wife of banker Arthur Clements Raymond. They previously had lived at 499 Audubon. 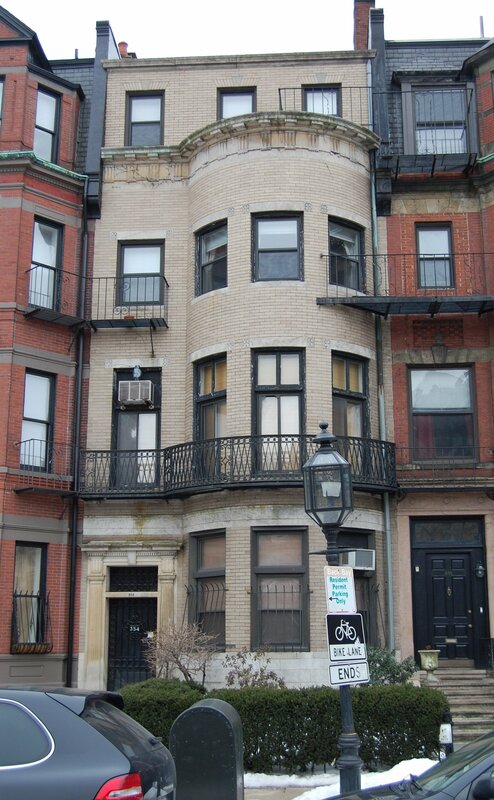 They lived at 354 Commonwealth during the 1905-1906 winter season, but moved thereafter to the Hotel Touraine (southeast corner of Boylston and Tremont). 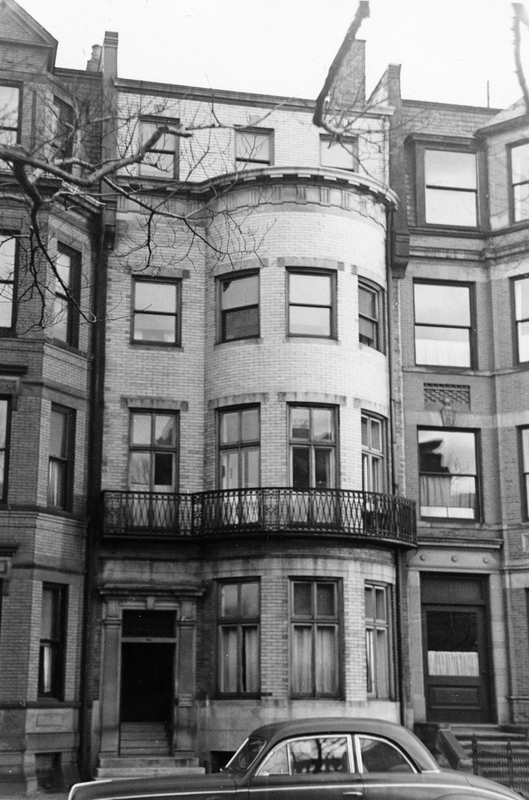 On December 7, 1906, 354 Commonwealth was acquired from Helena Raymond by Alice Pierce (Higgins) Leland, the wife of Dr. George Adams Leland They previously had lived at 669 Boylston, where he had also maintained his medical office. George Leland was an ear, nose, and throat specialist, and maintained his office at 354 Commonwealth. In 1880, he had served as an advisor to the Imperial Court of Japan in the development of their higher education system. He also served as a professor of laryngology and otology at Dartmouth Medical College. The Lelands continued to live at 354 Commonwealth until his death in March of 1924. Alice Leland moved soon thereafter, probably to Brookline to live with her son and daughter-in-law, George Adams Leland, Jr., and Letitia Gertrude (Brookins) Leland, with whom she was living in 1930. George Leland, Jr., also was a physician and maintained his office at 144 Commonwealth. On June 11, 1924, Alice Leland transferred 354 Commonwealth to a trust she established to manage her property for her benefit and the benefit of her children, with her son, George, Jr., and the Boston Safe Deposit and Trust Company as trustees. By 1925, 354 Commonwealth had become the Phi Mu Delta fraternity house. It had been located at 398 Marlborough in 1924. By 1926, it had moved to 378 Marlborough. By 1929, 354 Commonwealth had become a multiple dwelling, either apartments or a lodging house, and also the medical offices of Dr. Thomas J. Nash and Dr. Henry Manning Emmons. Thomas Nash, a physician and surgeon, previously had maintained his office at 350 Commonwealth. He and his wife Geraldine F. (Sennott) Nash, lived in West Roxbury. He continued to maintain his office at 354 Commonwealth until his death in January of 1937. Henry Emmons was an ophthalmologist and professor of clinical ophthalmology at Boston University. He previously had maintained his office at 320 Commonwealth. He and his wife, Selma (Jones) Emmons, lived in West Roxbury and then in Needham. In April of 1939, George Leland, Jr., filed for (and subsequently received) permission to convert the property from a doctor’s office and single-family dwelling into two medical offices and a single-family dwelling. In November of 1941, he applied for (and subsequently received) permission to convert the property into two medical offices and a lodging house. George Leland, Jr., continued to maintain his medical office at 144 Commonwealth and to live in Brookline until his death in September of 1943. 354 Commonwealth continued to be a lodging house and medical offices. Henry M. Emmons continued to maintain his office there and, by 1943, he and his wife had also had moved there from Needham. On April 7, 1944, 354 Commonwealth was acquired from the trust established by Alice Leland by Bernard H. Weiner (later known as Barnard H. Warner), a salesman, and his wife, Anna Beatrice (Klane) Weiner (Warner). They lived in Newton. On June 27, 1944, 354 Commonwealth was acquired from the Weiners by Robert W. Baker, who lived there and operated it as a lodging house. He continued to live there until about 1946. On May 21, 1946, 354 Commonwealth was acquired by Dr. Raymond James Nagle and his wife, Elva M. (Pomfret) Raymond, who lived there and operated it as a lodging house. He was a dentist and maintained his dental office there. They previously had lived at 491 Commonwealth and he had maintained his office at 358 Commonwealth. Henry Emmons appears to have retired from active medical practice in about 1947. He and his wife continued to live at 354 Commonwealth until about 1948. By 1950, they had moved to an apartment at 476 Beacon. By 1948, several other dentists had moved their offices to 354 Commonwealth, including Dr. Charles Frederic Sprague, who also lived there and in Rockport. He and his wife, Bonnie M. (Jarvis) Spague, previously had lived at 30 Bay State Road and he had maintained his office at 60 Charlesgate West. They divorced in the late 1940s. The Nagles continued to live at 354 Commonwealth (and he to maintain his office there) until about 1949. In 1950, C. Frederic Sprague married again, to Fredena Merle (Anderson) Young, the widow of Lloyd Emerson Young. After their marriage, they lived at 354 Commonwealth, and on March 2, 1951, they purchased the property. They also maintained a home in Rockport. By 1955, they had moved to Winchester. He continued to maintain his office at 354 Commonwealth. On August 18, 1953, 354 Commonwealth was acquired from the Spragues by Perez de Sola Zagorin and his wife Honoré (Sharrer) Zagorin. Perez Zagorin was a historian who had recently taught at Vassar and would later become an expert on British history; Honoré Desmond Sharrer was a noted artist. They lived in Cambridge. On March 31, 1954, 354 Commonwealth was acquired from the Perezes by wool importer John Austin and his wife, Maria Alexandra (Pakszwer) Austin. They lived in Brookline. In September of 1954, the Austins were cited by the Building Department for failure to have sufficient egress at 354 Commonwealth. In January of 1955, they filed for (and subsequently received) permission to install fire escapes. In their filing, they indicated that the occupancy was four dental offices on the first and second floors, and four apartments on the third and fourth floors. In November of 1956, they applied for (and subsequently received) permission to convert the property into three dental offices and five apartments. The property changed hands and on September 28, of 1966, was purchased by Harry Miller and his wife, Thelma Miller. In October of 1968, they filed for (and subsequently received) permission to legalize the property as eight apartments, which they indicated was the existing condition when they acquired the property. 354 Commonwealth changed hands and on June 9, 1972, was acquired by Robert White. He already owned twelve other buildings on the block – 324–326–328–330–332–334–336 Commonwealth, 344 Commonwealth, 348 Commonwealth, and 356–358–360 Commonwealth – and in 1978 he would acquire three more: 322 Commonwealth, 346 Commonwealth, and 350 Commonwealth. 354 Commonwealth remained an apartment building in 2018.